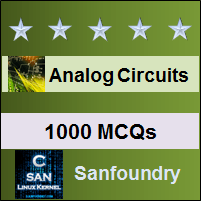 This set of Analog Circuits Multiple Choice Questions & Answers (MCQs) focuses on “Series Clipper-1”. 1. For a circuit given below, what will be the output if input signal is a sine wave shown below. Explanation: In the circuit of serial clipper, it clips the negative half cycle and the output will only contain positive half cycle. In this problem input is a sine wave, hence output will be positive half of sine wave. 2. For a circuit given below, what will be the output if input signal is a triangular wave shown below. Explanation: In the circuit of serial clipper, it clips the negative half cycle and the output will only contain positive half cycle. In this problem input is a triangular wave, hence output will be positive half of triangular wave. 3. 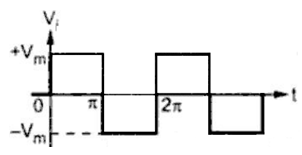 For a circuit given below, what will be the output if input signal is a square wave shown below. Explanation: In the circuit of serial clipper, it clips the negative half cycle and the output will only contain positive half cycle. In this problem input is a square wave, hence output will be positive half of square wave. 4. A simple circuit diagram for a serial clipper is given below. What will be the transfer characteristics of the circuit? Explanation: Since at constant voltage drop model voltage drop across diode at forward bias is a constant. In this circuit if input is negative diode is reverse bias hence no current. So for negative input output is zero. For positive input Vout will be equal to input with a voltage drop of VD. 5. For a circuit given below, what will be the output if input signal is a sine wave shown below. Explanation: In the circuit of serial clipper, it clips the positive half cycle and the output will only contain negative half cycle. In this problem input is a sine wave, hence output will be negative half of sine wave. 6. For a circuit given below, what will be the output if input signal is a triangular wave shown below. Explanation: In the circuit of serial clipper, it clips the positive half cycle and the output will only contain negative half cycle. In this problem input is a triangular wave, hence output will be negative half of triangular wave. 7. For a circuit given below, what will be the output if input signal is a triangular wave shown below. Explanation: In the circuit of serial clipper, it clips the positive half cycle and the output will only contain negative half cycle. In this problem input is a square wave, hence output will be negative half of square wave. Explanation: Since at constant voltage drop model voltage drop across diode at forward bias is a constant. In this circuit if input is positive diode is reverse bias hence no current. So for positive input output is zero. For negative input Vout will be equal to input with a voltage drop of VD.